Rotating machinery such as compressors, turbines, pumps, jet engines, turbochargers, etc., are subject to vibrations. These vibrations are broadly classified as synchronous( due to unbalance) or nonsynchronous such as caused by self excited rotor whirling. The three major areas of concern are rotor critical speeds, system stability and unbalance response. Critical speeds are the undamped natural frequencies of the rotor system. As a first step in turborotor design, an analysis is performed to determine the system critical speeds, mode shapes and energy distribution. The evaluation of the bearing strain energy, for example, can give us important insight as to whether we may expect to encounter stability and unbalance response problems for a particular mode. Usually the critical speeds are desired to be 10% to 20% above or below the operating speed range. However, there are many rotors that operate on top of the second critical speed due to sufficient bearing damping. Often attempts to elevate the 2nct critical speed by increased bearing stiffness leads to serious 1st mode stability problems. When bearing and seal damping is included, we can compute the damped natural frequencies or complex eigenvalues of the system. The real part of the complex eigenvalue determines the modal log decrement. From this quantity we can evaluate the stability margin and compute the rotor critical speed amplification factors. If the log dee is positive, the system is stable for that mode. If the log dec is > 2, then there will be little unbalance excitation. The rotor unbalance response represents the rotor synchronous excitation due to rotor unbalance, shaft bow or disk skew. The DYROBES program is capable of computing the rotor response due to these various excitation mechanisms. Under certain bearing or support conditions, the rotor response may be nonlinear. This is caused by nonlinear squeeze film dampers, rolling element bearings, or fluid film bearings with high unbalance. With some nonlinear effects, it is necessary to compute the time transient motion of the system. DYROBES may be used for time transient torsional as well as lateral response. In this presentation, some of the basic features of DYROBES will be presented starting with an introduction to rotor dynamics by first presenting an analysis of the single mass flexible rotor referred to as the Jeffcott rotor. The rotor model will then be extended to include damped bearings and flexible supports. 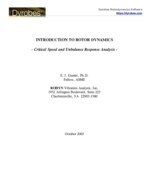 Analytical expressions are presented for this model for the computation of the critical speed, log dee and rotor response obtained for the rotor critical speeds. The DYROBES program will be used to illustrate the characteristics of the extended Jeffcott rotor on flexible supports and more complex rotors. Although the presentation is based on the simple Jeffcott rotor, the concepts are applicable to multi-mass rotors which operate below the second critical speed. Examples are given here to illustrate the use of the single mass results to industrial machines.